†Neutropenia defined as neutrophil count <500 cells/mm3. 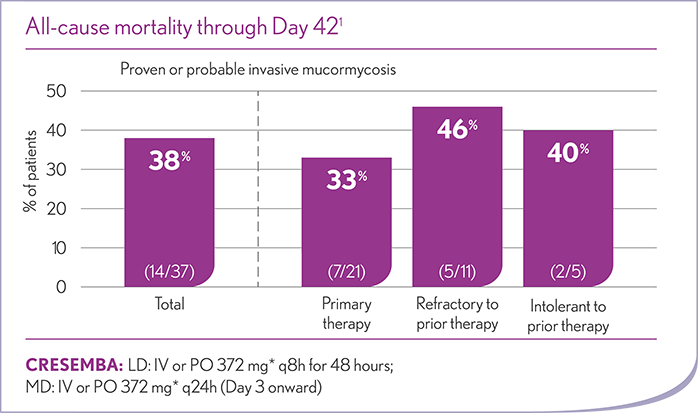 Therapy status assessed by DRC: Primary=patients received CRESEMBA as primary treatment; Refractory=patients’ underlying infection not adequately treated by prior therapy; Intolerant=patients unable to tolerate prior therapy. CRESEMBA was effective in the treatment of adult patients with proven or probable invasive aspergillosis.